Apart from howebrewing and writing about it on this blog, one of the things I enjoy most in this hobby is reading blogs where other homebrewers share their experiences. One of the most curious blogs I follow has to be Larsblog. 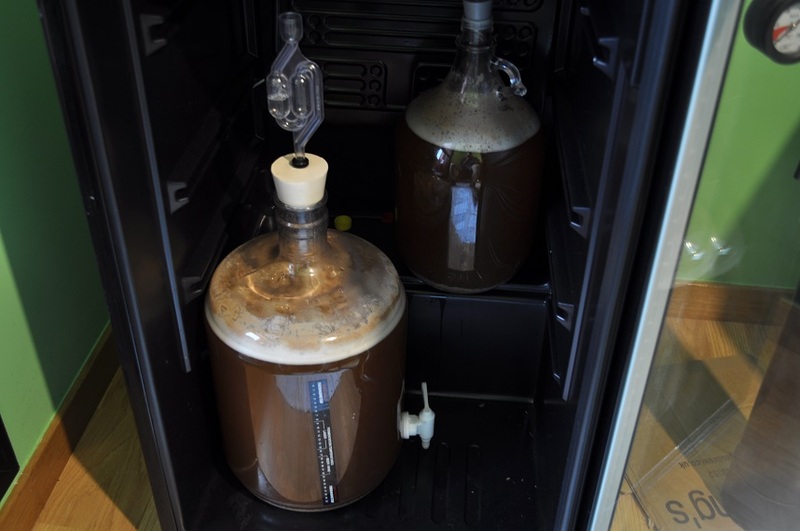 This blog is written by Norwegian blogger Lars Marius Garshol, who considers himself more a researcher than a homebrewer. Lars visits farms from his native Norway (and from other countries of Northern Europe, as Lithuania), researching ingredients, equipment and traditional processes, some of them centuries old. They have high heat tolerance. 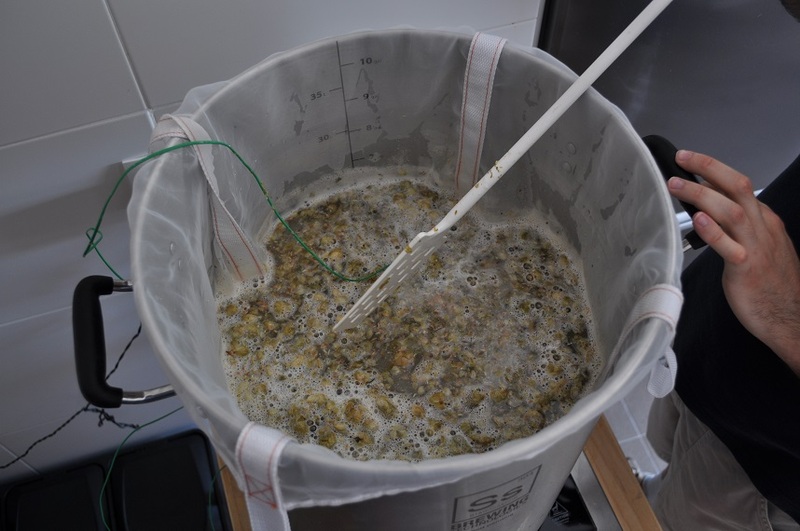 In fact, their bests results are produced when fermentation temperature is above 30ºC (86ºF), with 35ºC-40ºC (95ºF-104ºF) being a normal range for them (it could be an opportunity for those homebrewers not able to control their fermentation temperature in the summer). They tend to produce a similar ester profile, no matter the temperature, when “normal” yeasts tend to produce some undesirable compounds at high temperatures. 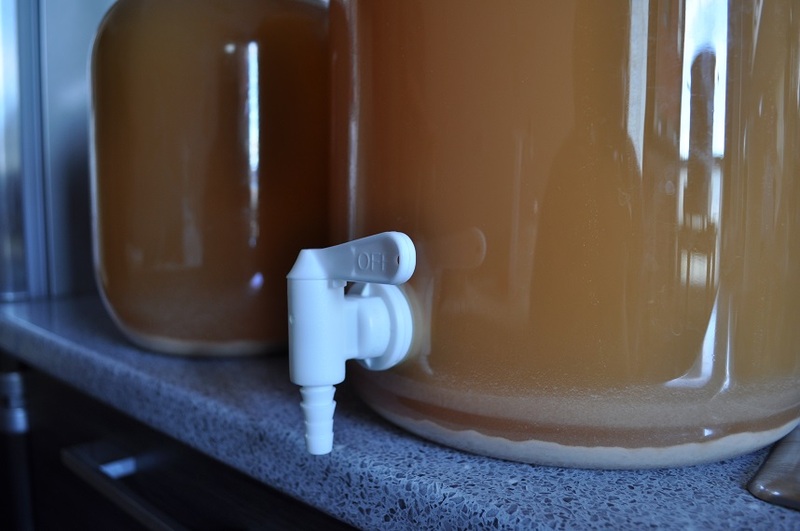 Underpitching is a common thing for these type of yeasts, avoiding the need for starters. They have high alcohol tolerance. It’s common to see beers made with these yeast having 7-9% alcohol by volume (remember these yeasts are usually underpitched). They can be dried and reused. If you want a more detailed information, you can visit the entry about Kveik in the wiki form the Milk the Funk website. Instead of water, juniper infusion is used. Only pilsner malt is used. Mash starts at 69ºC (156ºF) and it should not finish below 50ºC (122ºF). Noble hops are added again 15 minutes before finishing the boil (bitterness is usually low for this beer style). 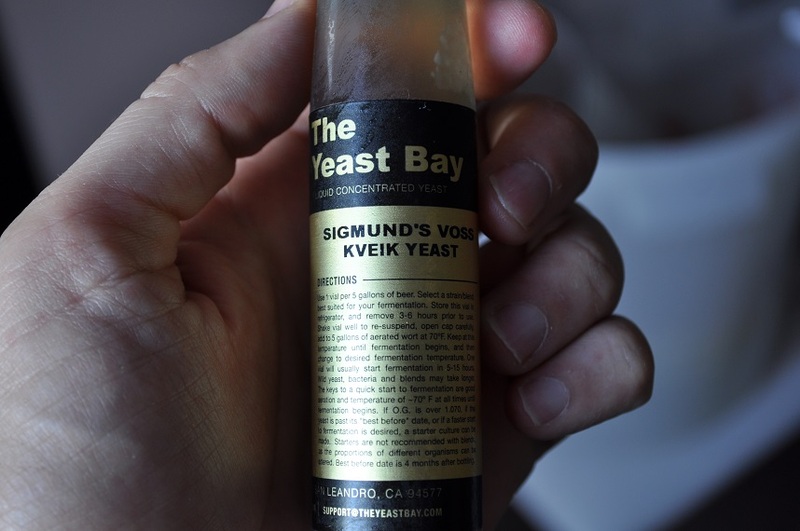 For the yeast, we were able to get a vial of Sigmund’s Voss Kveik, commercialized by The Yeast Bay. It is a single strain of Saccharomyces cerevisiae isolated from a sample of kveik provided by Sigmund Gjernes (also the brewer of the beer we were trying to emulate) via Lars Garshol. Below it is a description of the ingredients we used for this recipe and the process we followed. 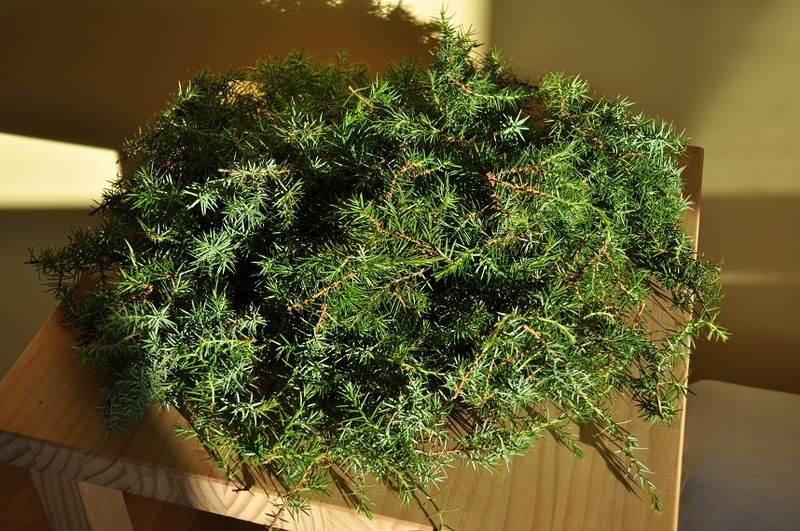 Heat water (30 liters, 7.9 gallons) with juniper until it reaches about 74ºC (165ºF). Turn off the heat and let it steep for 15-20 minutes. Set aside 10 liters (2.6 gallons) from this infusion and use the rest for mashing. Mash out at 74ºC (165ºF) for 5-10 minutes. Boil wort from mashing plus the reserved volume of juniper infusion for 3 hours. A few days before brewday, we had everything ready except, of course, juniper. Fortunately, in the outskirts of where we live there are woods with plenty of juniper shrubs. So we planned a little excursion to recollect a couple of bags of juniper tips, the green ones, avoiding juniper berries and branches. After a little research, we found out Juniperus communis to be the most common species in our area, the same that grows in the Nordic countries from where this recipe is originated. Be careful because some types of ornamental juniper may be toxic. In the picture above you can see the amount we used for this beer. We didn’t weight it, so we don’t know exactly what amount it was. We put juniper tips in the kettle with 30 liters (7.9 gallons) of water and we heat it until it reached about 74ºC (165ºF). After turning off the heat, we let it steep for 15-20 minutes while we milled the grains. We took off a lot of things coming from the juniper tips with a strainer so they didn’t pass to the wort. After that time, we remove juniper to a 11 liters (2.9 gallons) thermos, where we also kept 10 liters (2.6 gallons) from the juniper infusion. 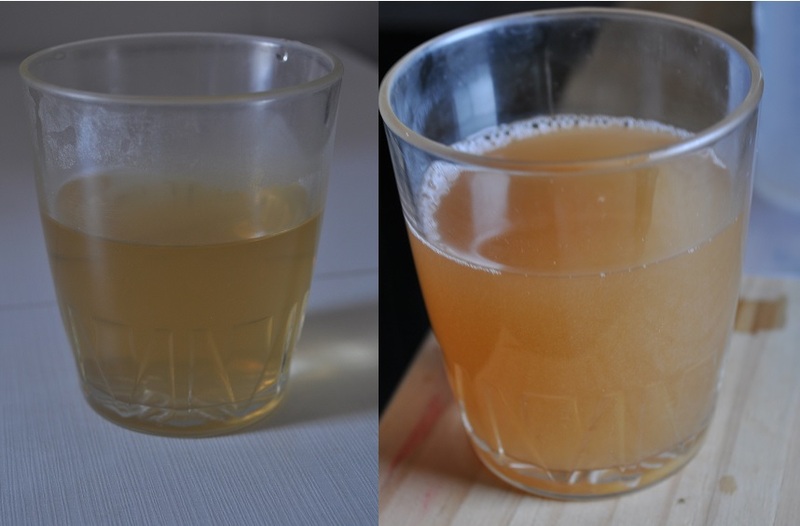 As you can see in the picture below, water had then a yellowish color and a characteristic juniper aroma. To the 20 liters (5.3 gallons) of water still in the kettle we added 55 mL of sulfuric acid, the amount the Bru’n Water spreadsheet told us it was necessary to obtain a mash pH of 5.48. After putting our brew bag in the kettle, we slowly added the milled grain while we stirred to wet the grains. We also added 20 g (0.70 oz) of Spalt Select hops, first time we were using hops in the mash. We stir a little bit more and put the lid on, with the starting mash temperature at 69ºC (156ºF). Since mash was going to take a lot of time we went for lunch. After 4.5 hours, mash temperature was 53ºC (127ºF), above 50ºC (122ºF), which was the minimum temperature the mash should reach. We took a sample to measure pH, and after cooling it, we read a pH value of 5.47, almost the same value Bru’n Water had predicted. We mashed out at 74ºC (165ºF) for 5-10 minutes. We remove the bag with grains and hops and we added the volume of juniper infusion we had reserved with the juniper tips. We started the boil with 26.7 liters (7.1 gallons) of wort. At the same time, following instructions, we took of the yeast from the fridge so it could warm slowly. We boiled for 3 hours, adding 20 g (0.70 oz) of East Kent Goldings hops 15 minutes before the end of the boil, using for the first time our new hop spider. We ended with a little more volume than expected, a little above 15 liters (4 gallons). We cooled with a cooper immersion chiller as fast as we can until the wort reached about 43ºC (109ºF). We pitched the yeast at this temperature directly from the vial and, after shaking to get some oxygen needed by the yeast to growth, we distributed the entire volume of wort between a 12 liters (3.2 gallons) PET demijohn and a 5 liters (1.3 gallons) glass demijohn. In the picture below you can see the effect of such a long boil in the color of the wort. The final gravity was 1.050, a little less of the usual value for these styles. We put both demijohns in our fermentation chamber, trying to keep the temperature they had as much as possible. The next day after returning from work, 20 hours after pitching the yeast, both recipients showed a lot of activity and krausen was starting to form in both of them. The PET demijohn, with a stick on thermometer was at about 30ºC (86ºF). The following days the maximum temperatures were going to be around 35ºC-37ºC (95ºF-99ºF) (we had planned this beer having this into account, since these temperatures are not usual in our city). Our idea was to keep the small glass demijohn inside the fermentation chamber (turned off), at a room temperature of about 25ºC (77ºF) and the PET demijohn outside in a terrace (covered with a towel) at temperatures above 35ºC (95ºF) during the day and in the fermentation chamber at night. The objetive for that was to see if we could detect differences between fermenting at 30ºC-35ºC (86ºF-95ºF) versus fermening at 25ºC-27ºC (77ºF-81ºF). High krausen was between days two and three in both demijohns. For four days airlock activity was clearly visible and from then it started to slow down. Until the fifth day, the PET demijohn was at a minimum temperature of 28ºC (82ºF) and a maximum temperature near 35ºC (95ºF), keeping it in the terrace during the daylight, with an average temperature of about 30ºC (86ºF). Meanwhile, the small glass demijohn was almost all the time about 25ºC (77ºF). From the fifth day onwards we left both demijohns in the fermentation chamber at 25ºC (77ºF), which would be maintained for a few more days, until two weeks from brewday passed. During those last days both beers cleared and turned orange. Two weeks from brewday, we transfer both beers to a secondary fermenter to leave behind most of the trub and we set the temperature of the fermentation chamber at 17ºC (63ºF). Due to a lack of time, we left them both one more week in secondary at that temperature. After seven days in these conditions, we bottled 8 liters (2.1 gallons) from the PET demijohn and about 4 liters (1,1 gallons) from the small glass demijohn (we had left the rest of the volume when transferring from primary to secondary to avoid trub). 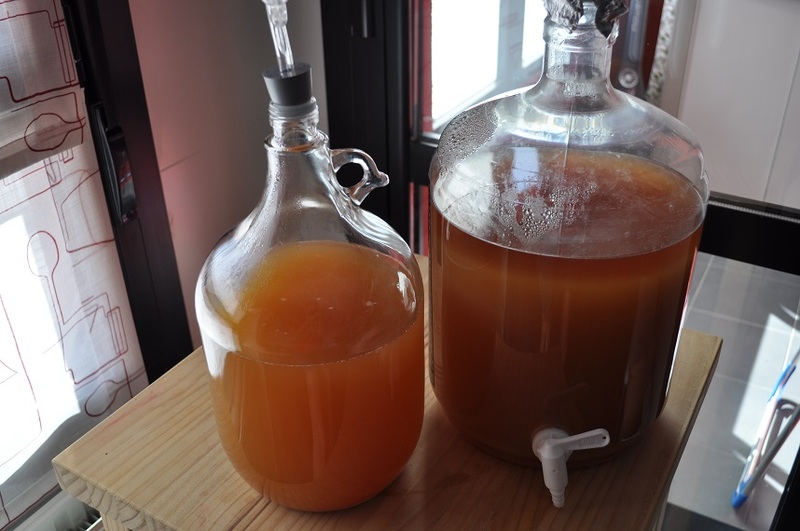 Final gravity was 1,009 for the beer in the PET demijohn, fermented at higher temperature, and 1,010 for the beer in the glass demijohn, fermented at a lower temperature. Thus, the alcohol by volume for the beers was 5,4% and 5,2%, respectively. Targeting 2,2 volumes of CO2 for carbonation, we added 43 g (1.52 oz) of table sugar to the volume from the PET demijohn and 21 g (0.74 oz) to the volume from the glass demijohn. From the first one we bottled a 75 cL bottle (25.4 oz), 3 50 cL (16.9 oz) bottles and 16 33 cL (12 oz) bottles, while from the second one we bottled we bottled a 75 cL bottle (25.4 oz), 2 50 cL (16.9 oz) bottles and 6 33 cL (12 oz) bottles. We left them at 23ºC (73ºF) to carbonate for at least two weeks. In a coming post we will tell you how they ended. In conclusion, a very curious process the one used to brew this style. Kveik yeast works really well (attenuation near 80%) at temperatures at which others yeasts would even die. As we said before, an excellent alternative for those homebrewers who don’t brew in the summer because of high temperatures, apart from some saison strains. We are sure that, after working with Kveik, we will use it again to see how it works and what it contributes with other more conventional beer styles. In some places they even place Kveik as the next big thing in the brewing world, we’ll see. This entry was posted in Elaboration and tagged Elaboration, experimental, farmhouse ale, juniper, kveik, Norway, recipes, yeast bay. Bookmark the permalink.